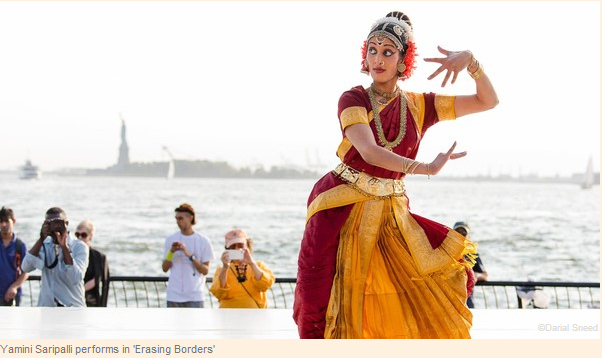 Erasing Borders : IAAC Festival of Indian Dance 2014. For the final number in Erasing Borders’ outdoor show (the indoor edition takes place on September 5-6), Srishti Dance of India divided the stage not only between bharata natyam and odissi dancers but between praying and fighting, praising Vishnu and becoming him in all his avenging fury. Worshipper and worshipped, mortal and god, rite and drama: this brilliantly curated event amply confirmed that Indian classical dance proceeds by complement and contrast, if not within each of its eight idioms – every one of which was represented here – then between them. In a particularly lovely rendition of the invocation to the elephant god Ganesh, kuchipudi practitioner Yamini Saripalli suggested the trunk’s swing by loosely lifting her leg, and its finger-like grasp by keeping one hand closed like a bud. She conveyed the elephant’s girth and gentleness with swaying, sideways steps, and his massive feet with heel-toe stamps. And yet she would periodically interrupt the rhythmic dancing to press her palms together in prayer to the figure she had just embodied, then stretch her arms toward us as if to say, “Look what bounty he has given me: you.” We were her pious reward – devotees of Ganesh by way of her art. Indian classical dance blurs as many distinctions as it makes. Women typically perform the male deities, whom they endow with feminine graces. Sprightly manipuri soloist Noopur Singha evoked Krishna with lilting jumps and twirls, and sattriya master Anita Sharma did so with sinuous arms. The stocky Gupta’s stance was wide as a cowboy’s. His steps were heavy with deliberation: no bounce, no spring, falling like stones. After Lady Macbeth whispered poison in her husband’s ear, however, Gupta became still and impassive, wrists emphatically limp as she waited for her husband to act. Now she was more inscrutable ornament than forthright agent, with only her demented gaze betraying any life.